The anti-religious and dictatorial communist officials who have been badmouthing the Dalai Lama, one of the greatest living spiritual gurus in the world, cannot be expected to know about Asra Nomani, the celebrated author of Standing Alone in Mecca: An American Woman’s Struggle for the Soul of Islam. But if anyone in China wants to know why His Holiness is revered by Indians and those in the rest of the world who do not equate religion with “the opium of the people”, should turn to this book by the Bombay-born Indian-American journalist (formerly with The Wall Street Journal). This is how Nomani begins her fascinating account of self-discovery. ALLAHABAD, INDIA: One hot winter afternoon, I was lost in India on the banks of the Ganges, a river holy to Hindus... By chance, my path intersected with the spiritual leader of Tibetan Buddhists, the Dalai Lama, inside an ashram, and he set me off on my holy pilgrimage to the heart of Islam. It was January 2001, and I was, quite fittingly, in the city of Allahabad, “the city of Allah,” the name by which my Muslim identity taught me to beckon God. Although a Buddhist, the Dalai Lama, like millions of Hindu pilgrims, was in a dusty tent village erected outside Allahabad to make a holy pilgrimage to the waters there for the Maha Kumbha Mela. He joined the chanting of a circle of devotees dressed all in white. When they had finished, I followed the Dalai Lama to a press conference...(where) an Indian journalist raised his hand. “Are Muslims violent?” he asked. 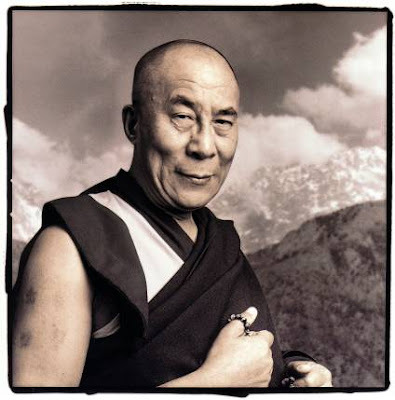 The picture of the Dalai Lama that Nomani presents is that of a true spiritual giant, one who respects all faiths, nurtures ill-will towards none, and is candid in admitting that even followers of his faith might sometimes do wrong things. He has displayed these and several other positive qualities in his leadership on the Tibetan issue. He has exhorted his followers not to use violence in protesting against their ill-treatment in China. He has wished well for the successful organisation of Beijing Olympics. He has been most reasonable in the dialogue he wishes to have with the Chinese leadership to find a just solution to the issue that has been agitating him and his people ever since China annexed Tibet in 1951. And yet, Beijing portrays him as a demon. It is high time China did some honest introspection as to why, despite its proud and spectacular economic progress, the Olympic torch is inviting protests in city after city around the globe. The world may admire China for planning to host what promises to be the most fabulous Olympics ever—the recently opened third airport terminal in Beijing is truly Olympian in size: it is two miles long and bigger than all the five terminals of London’s Heathrow airport put together. But to earn respect, China must grant basic freedom, above all, religious freedom, to its people. This is where the contrast between India and China is the most glaring. While religion and spirituality have been ruthlessly suppressed in communist China, these continue to be the soul of India, where people of all faiths can practise their beliefs unhindered. India has always placed saints and mahatmas on a higher pedestal than politicians. This explains why the Dalai Lama, seen as a living embodiment of Buddhism’s universalist ideals, is widely respected in India. Communist China has no place for any saintly figure. It recognises only one God: the Party. Can we imagine the Party giving the Dalai Lama the freedom to move around in China, preach his ideals, go on pilgrimages, address press conferences and participate in inter-faith celebrations? This can happen only when China, home to a great and ancient civilisation, discards the Party, which, for its own survival, has turned the country into a spiritually barren land.